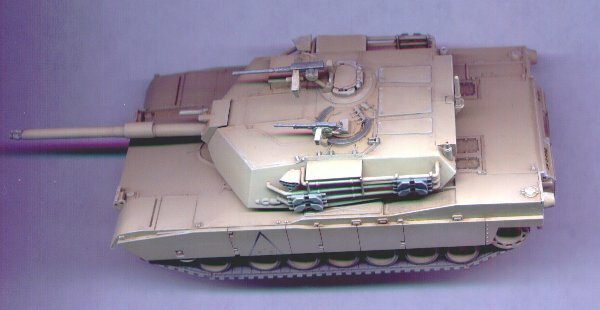 One of three M1 Abrams in 1/72nd scale (the others are ESCI and Matchbox), this kit was pretty good. It is better than the competition in some areas, but not as good in others. Please see my M1 Abrams Comparison article for a complete comparative review of these kits. This kit represents the base M1 version of the Abrams, and it does it very well. All of the kit's details are appropriate for this version. The overall level of detail and quality of molding is very good. Some of the details could be a little finer, but I was quite pleased with what comes out of the box. The turret is armed with the standard 105mm cannon, which is molded as a single piece, plus a separate piece for the tip of the barrel, as well as two MG's on the roof: a .50cal for the commander, and a 7.62mm for the gunner. The MG's could use a little more detail. Both hatches are molded open. The wind sensor at the rear of the turret is a very tight fit. Be sure to sand it down some. Also, after gluing it in position, it would benefit from some filler to blend the mount into the turret, which I failed to do (see photo). The rear fenders have an optional length, depending on which particular vehicle is being modelled. The side skirts also have an optional shape for the rearmost panel, allowing for the unique cutout shape that most Abrams had. The driver's hatch on the front hull is molded shut. One commander figure is included, and is actually fairly nice. The main detraction of this kit are the bogie wheels. As is common for models of most modern tanks, each pair of bogie wheels is molded as a single, double-wide wheel. I have absolutely no idea why several manufacturers decided to do this. It makes absolutely no sense at all. Also, the sprocket wheel should have four very large holes in the "drum" portion of the wheel. Assembly of the kit was simple. Everything fit very well. Once again, it may be easiest to glue on the tracks prior to attaching the upper hull. Of course, this makes for some creative paint sequencing. The tracks are lengths of hard plastic; no individual links. Several lengths need to be scored with a knife, and then bent into shape around the idler and sprocket wheels. Overall, I was very happy with the way the tracks turned out. I drilled holes in the lift hooks next to the headlights and by the exhaust grates.